Guinea pigs, or cavies, as they are also called, are not immune to fleas. They can be plagued by fleas just as dogs and cats can. If your guinea pig begins itching a lot more than usual, check his coat and be prepared to handle your business. It's important to keep your guinea pig clean. Cavies can and do get fleas, it can happen if other animals in the house have not been treated for fleas and are bringing them in from other sources. Cats and dogs living in a home where guinea pigs live should be flea-free so they don't pass these little monster bugs on to other hosts. Fleas are dangerous in large numbers, as they can cause flea allergies that lead to dermatitis, as well as anemia if they remove enough blood from the guinea pig. Be sure to always check with your veterinarian before using any product on your guinea pig that is not specifically formulated for guinea pigs. The best solution is to give your guinea pig a bath. You don't have to use a flea shampoo; any small-pet shampoo will do -- the shampoo isn't killing the fleas, the water is. They simply drown. But don't use a human shampoo, it will irritate your guinea pig's skin and eyes. Guinea pigs are small prey animals that frighten easily, so make bath time as stress-free as possible. Use a shallow bowl and warm water. Immerse your cavie, holding him firmly but not too tight. Pour the water over him, then apply and massage in the shampoo. Rinse well. Make sure you get all the residue off, or he will itch from dry skin. If he squirms and seems to be upset, stop the bath. Small animals can have heart attacks simply from being afraid. Currently no spot-on treatments approved for guinea pig flea prevention is available in the United States. Two spot-on treatments are marketed in the United Kingdom. Check with an exotic pet veterinary specialist to determine of current products made for cats may be used on guinea pigs. Some guinea pig owners will cut the dose of a cat spot-on flea treatment for use on their pet, but this is not a traditional treatment, so you must check with your veterinarian before considering the option. 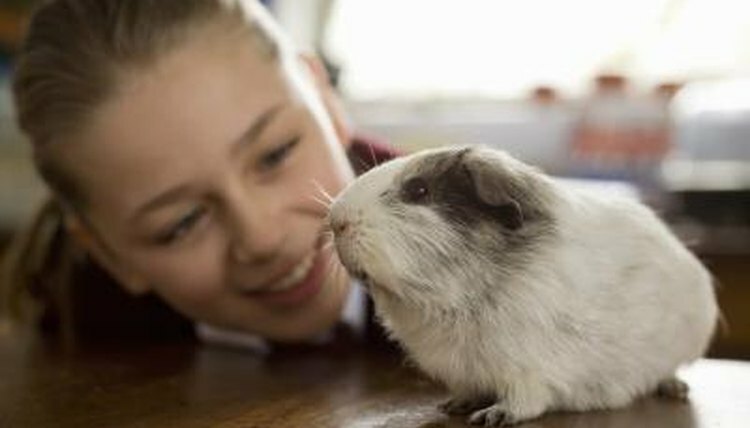 The best way to ensure your guinea pig is not plagued by fleas is to keep his habitat clean and to make sure any other household pets are not carrying fleas. Check your guinea pig's coat on a regular basis and look for live fleas and evidence of fleas such as flea dirt, which looks like coffee grounds and smears rust-color. It is actually flea excrement. What Is the Best Product to Kill Fleas? How Many Generations Can a Flea Produce in One Year?